Windows Update is a free Microsoft service that's used to provide updates like service packs and patches for the Windows operating system and other Microsoft software. Windows Update can also be used to update drivers for popular hardware devices. Patches and other security updates are routinely released through Windows Update on the second Tuesday of every month — it's called Patch Tuesday. However, Microsoft releases updates on other days as well, like for urgent fixes. What Is Windows Update Used For? Windows Update is used to keep Microsoft Windows and several other Microsoft programs updated. 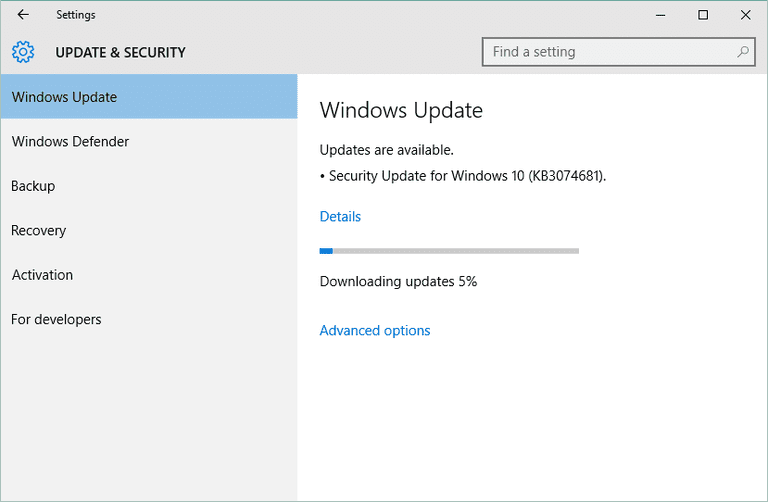 Updates often include feature enhancements and security updates to protect Windows from malware and malicious attacks. You can also use Windows Update to access the update history that shows all the updates that have been installed to the computer through the Windows Update service. Windows 10: Windows update is built-in and a part of System Settings, available from the Start menu. Windows 8, Windows 7, and Windows Vista: Windows update is integrated as a Control Panel applet and is accessible from within Control Panel. Windows Update can also be accessed in those versions of Windows by executing the control /name Microsoft.WindowsUpdate command from the Run dialog box (Windows Key + R). Windows XP, 2000, ME, 98: Windows Update is accessible using the Windows Update website through Internet Explorer. See How to Check For & Install Windows Updates if you need more specific instructions. Open the Windows Update Control Panel applet (or launch the Windows Update website in older versions of Windows). A list of available updates, customized to your specific computer, is shown. Select the updates you wish to install and follow any instructions given to download and install the updates. Most of the process is entirely automated and might require just a few actions on your part, or you'll be prompted to restart the computer after the updates are finished installing. See How Do I Change Windows Update Settings? for help customizing how Windows Update downloads and installs updates on your computer. All Windows operating systems since Windows 98 — Windows 10, Windows 8, Windows 7, Windows Vista, and Windows XP — use Windows Update. However, Windows Update does not update most of your other, non-Microsoft software. You'll need to update those programs yourself or use a free software updater program to do it for you. The Critical Update Notification tool (which was later renamed to Critical Update Notification Utility) is a tool Microsoft released around the time of Windows 98. It runs in the background and notifies you when a critical update is available through Windows Update. That tool was replaced by Automatic Updates, which is available in Windows Me and Windows 2003 SP3. Automatic Updates allows updates to be installed without having to go through a web browser, and it checks for updates less frequently than the Critical Update Notification tool. Since Windows Vista, updates may have the .MANIFEST, .MUM, or .CAT file extension to indicate a manifest file, Microsoft Update Manifest file, or security catalog file. See our guide on How to Fix Problems Caused by Windows Updates if you suspect that a patch is the source of an error message or other problem. Some non-Microsoft programs install Windows updates if you don't want to use Windows Update. Some examples include Windows Update Downloader, Autopatcher, and Portable Update. Windows Update is not the same utility as the Windows Store, which is used to download music and apps. Although Windows Update can update some device drivers, many aren't provided by Microsoft. These might include anything from a video card driver to driver for an advanced keyboard, in which case you'll want to update them yourself. One really easy way to download and install drivers without using Windows Update is through a free driver updater tool.